A proposed urban rail line is one small step closer to becoming a reality after a panel of local officials, business leaders and citizens voted overwhelmingly to recommend the $1.38 billion proposal. The Central Corridor Advisory Group voted 13-1 in favor of Project Connect's 9.5 mile plan. "The last time we put this option before voters was 14 years ago," Mayor Lee Leffingwell said. "I've been conscious all along that we had to put a good and appealing project before the voters. I think this recommendation will do that." The lone dissenting vote was from public transit advocate Julie Montgomery of AURA. Among her concerns is that parts of the proposed route are not in areas where urban rail is in high demand. "I fear that this plan will not get public support," Montgomery said before the vote. "Folks are suffering under their property taxes and I think this plan both costs a lot and is risky." The proposed urban rail route (see image) goes down East Riverside Drive from Grove Boulevard through downtown, the University of Texas campus, the Hancock Center and ends at the Highland Mall. Supporters of the route say more people will live near it in the future as Austin grows and its population density increases. "To really understand the potential of the proposed route, it's important to understand that the destinations along the proposed route will look a lot different than they do today," said Larry Graham with the Downtown Austin Alliance, which supports the proposal. The Austin City Council has until August to decide whether to ask voters to approve an urban rail bond in November. The proposed bond would likely be $700 million, about half the cost of the project, with the assumption that the Federal Transit Administration would pay the other half. A $790 million bond would cause the city portion of your property tax bill to go up by 5 cents per $100 of property valuation, according to a city budget presentation from April. That's about 10 percent over the current city of Austin tax rate of 50.27 cents per $100 of property valuation. 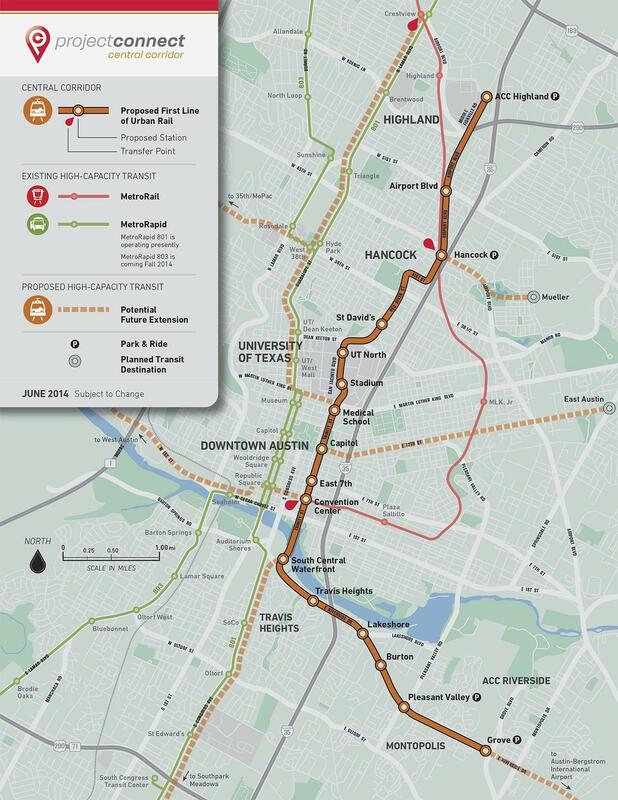 Why is Project Connect Handing Out This Inaccurate Urban Rail Map? Disclosure: Project Connect is a sponsor of KUT. Update: Project Connect has issued a new flyer. Scroll to the bottom of this post to read it. Original story: If you were out and about in Austin this weekend, you may have met someone from the outreach team of Project Connect, a multi-agency group working on mass transit options for the region. In an effort to promote a series of meetings regarding an urban rail proposal that will likely end up before voters this fall, the outreach team was passing out flyers showing the proposed first rail line in Hyde Park. But those flyers don’t accurately show what that proposed line is, and now one neighborhood advocate is accusing Project Connect of misleading the public. A few hundred Austinites got a flyer (above) from a Project Connect outreach team this weekend showing its overall long-term transit vision for the city. 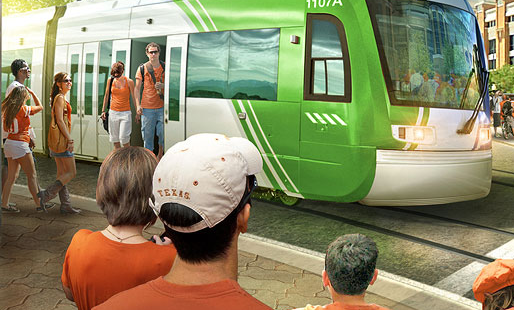 At the bottom right corner of the flyer, a big orange bubble screams, “Let’s Get Moving!” The flyer shows rail to the airport, rail along the major corridors of Lamar and Congress, and along the MoPac freeway. In essence, rail lines that have the potential to replace lots of cars on the road. The map is titled "Proposed First Line of Urban Rail." There is no legend indicating what the various routes depicted are. But if you were to actually pass out an accurate map of the proposed first line that voters may decide on this fall – which in its latest iteration would run along East Riverside, through downtown and tunneling under and then paralleling a portion of the existing MetroRail line up to Highland Mall – it would actually look very different. Austin is inching its way towards the creation of a possible new rail line. Later today, Project Connect, a group of regional transportation officials including the City of Austin and Capital Metro, is widely expected to unveil a proposed route for urban rail. 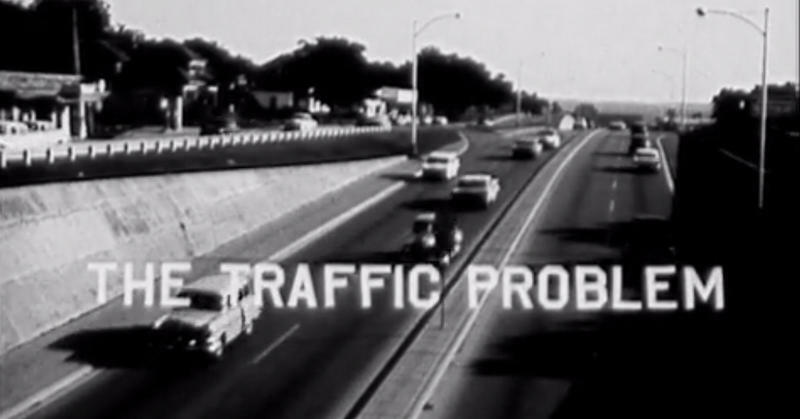 The announcement is a further refinement of preliminary findings tapping the East Riverside and Highland Mall regions as prime corridors for investment – a finding many Austin transit advocates found fault with. Once set for the ballot by the Austin City Council, citizens will vote on whether to approve rail funding in an election this November. When was the last time you were at Highland Mall? For many Austinites, the retail ghost town isn’t on their hot list of places to hang out. But city planners are counting on that to change, and they’re willing to place a bet on it, to the tune of $1.4 billion. That’s the estimated price tag for the urban rail line recommended by Project Connect, a group of regional transit agencies working on mass transportation. To justify it, Project Connect has projected explosive growth around Highland Mall, at a rate much faster than the city of Austin as a whole is projected to grow over the coming decades. How did Project Connect come up with these numbers?